If you have an iPhone 4S, try this. 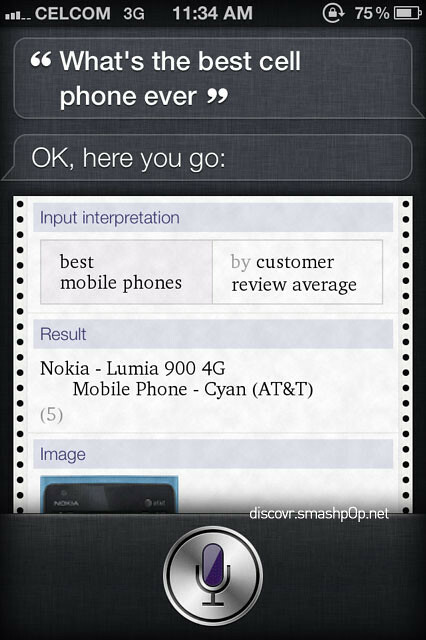 Launch Siri and ask “What’s the best cellphone ever”… and she will tell you that the Nokia Lumia 900 is the best. The result is hilarious but seems like Windows Phone’s customer satisfaction scores have finally started to penetrate even Siri had to report that since she doesn’t lie. Siri, if you didn’t know yet, it grabs answers that your ask everyday from WolframAlpha. And you can actually see the result on their website as well. Thanks Ridhuan for the screenshot!